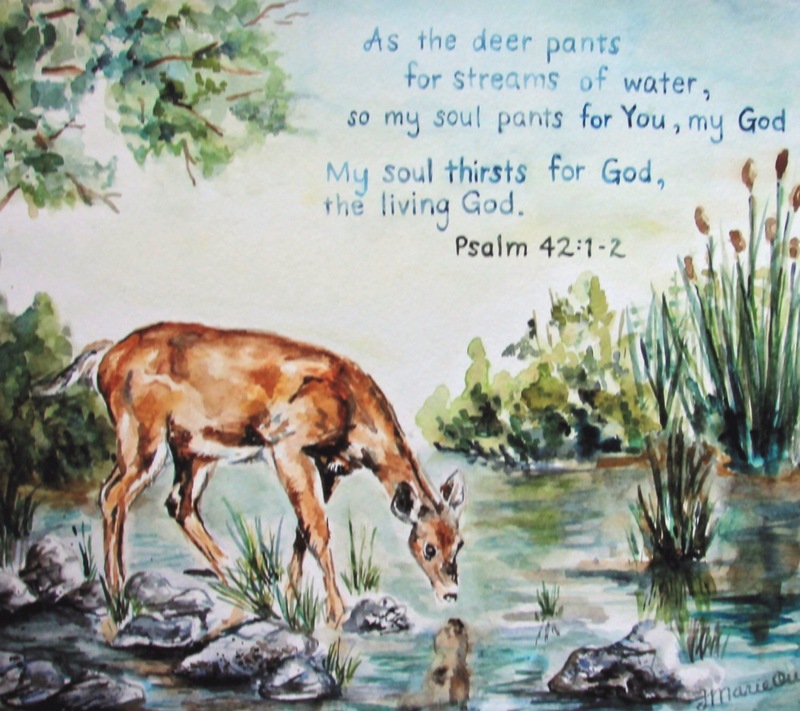 As the deer panteth for the waters so my soul! You alone are my Strength my Shield! To what and to whom does your spirit yield to? Does your spirit yield to God or to man? Does your spirit yield to His will or to your own will? Does your spirit yield to His Spirit or to your flesh? Who exactly are you yielding to? Tonight think about that, and whatever it is that you are yielding to is it worth staying yielded to? Or should you let go? For many of us God is not the only One that we have yielded ourselves to, in fact there are many others, many, many others. Don’t allow the many others to stop you from being yielded to The One worth knowing, Jesus Christ. The many others are most commonly known as distractions. Christians don’t have time for that. Christians do not have the time to be listening to too many voices, when we have the best voice to listen to the voice of God. The voice of God, that’s the most important voice. The soul will follow once we train our spirit to yield to the very will of God. Christians please remember that we are in the last days. There is no time for yielding ourselves to anything other than the spirit of God. I don’t think I can get friendly with this message anymore. It’s either we yield ourselves to God and receive eternal life, remember there is no death in Christ. Or we yield ourselves to satan and receive eternal damnation. Continue to play games with God and that’s the dreaded destination. Who are you yielded to? If you’re a Christian and it’s not God it’s time to get your act together and get stuck into His Word! A Christian without the Word of God, is a Christian without Christ. How can a Christian be without Christ? It doesn’t make sense but that’s how many Christians are like today. Jesus Christ is the Living Word, that means we’re not only supposed to read The Word but we are also supposed to live it! As Christians we ought to yield ourselves to The Word of God. The Word of God is always relevant. The worldly man will say that the media is relevant and The Word of God is irrelevant. God describes such a man as foolish, and I agree. Be ready, and be yielded to The Spirit of God. The Spirit of God does not use profane language. I don’t understand why many Christians feel that the use of curse words is ok.
Now is not the time to say well I’m not perfect so let me continue to make excuses to dwell in sin. No we’ve passed that, it’s time to overcome! It’s time for me to ask myself who am I yielded to my flesh or the Spirit of God? Listen if it is the Spirit of God that you are yielded to then the flesh no longer has control over you His Spirit does. Even Christians time doesn’t wait for. God gives everyone chances it’s up to you. After all it’s free will isn’t it? What you do with your time will determine your destiny, your destination, where YOU are headed to. Use your time, wisely and not wastefully. Yield to His Spirit and He will grant you wisdom. Yield to satan and he will give you foolishness. I want to remind Christians again that we are in the last days because it’s like a lot of us are still not aware of it. It’s like a lot of us are living what we feel a Christian life should be. A lot of us are failing to acknowledge the Holy Spirit. I’m a Christian and I like to be convicted I don’t like to be comfortable. When you’re a Christian you can’t be comfortable. It’s impossible to stay the same as a Christian. He says come as you are but you can never stay the way you are. When you yield to His Spirit you have to be prepared for change. There’s nothing satan loves more than familiarity, and he uses that to accuse the children of God to put us into shame and disgrace. God loves change, He loves transformation and He uses that to get you to the place that He has called you to be in. That’s called the place of greatness, and the only way to get to that place is by yielding ourselves to His very will. Heavenly Father please forgive us if we have ever yielded ourselves or are yielding ourselves to anything and everything that is not of You. Lord we want to be more like You. You are our heart’s desire, we long to worship You in Spirit and in truth. And so Lord we come to you with a heart of total surrender to Your will and to Your way. Lord we are tired of being lukewarm, we understand that these are the last days, please help us oh Lord to walk in Your Light always. We are tired of making excuses for our sins oh Lord! Take over, we surrender all to You. Have Your way in us oh Lord. Tonight our prayer, our desire is to yield our spirit to Your will, by doing so our soul shall surely follow. The more time you spend with The Lord the more encounters you’ll have with Him.